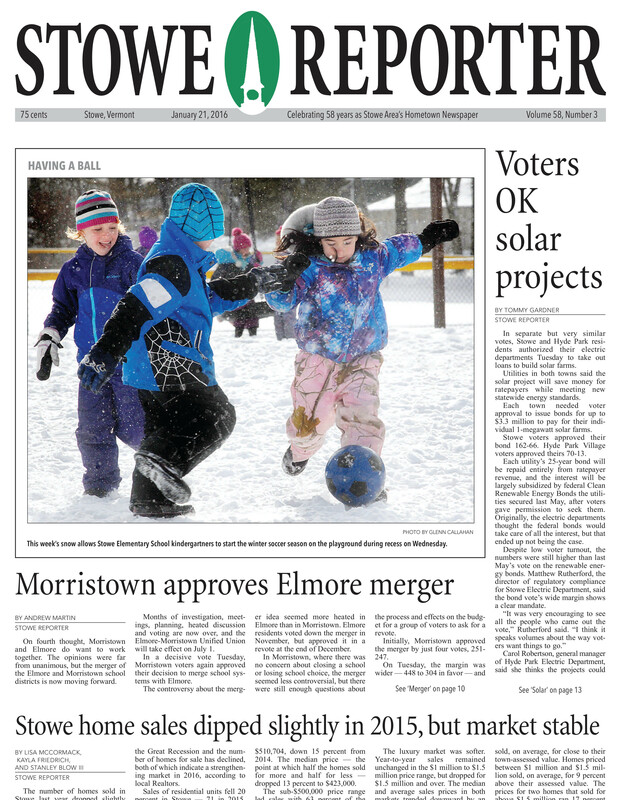 On January 21, Lisa McCormack, Kayla Friedrich, and Stanley Blow III of the Stowe Reporter did an article about the real estate market in Stowe which featured Broker McKee Macdonald of the Smith Macdonald Group of Coldwell Banker Carlson Real Estate, and his views on the past year in real estate as well as what we can expect to see in 2016. Also used in the article were statistics and charts from the 2015 Year-End Smith Macdonald Report. Things are looking up in the local real-estate market, where right-priced homes and low mortgage rates have sparked an increase in sales. First-quarter real-estate sales in Stowe ran 24 percent ahead of year-ago numbers, and across the rest of Lamoille County, sales were up 25 percent. “On the heels of 2010’s 30 percent increase in annual sales vs. 2009, this is a positive indicator that the Stowe-area real-estate market is continuing a move in a healthy direction,” said McKee Macdonald, a broker with Stowe-based Smith Macdonald Real Estate Group, part of Coldwell Banker Carlson Real Estate. • Fourteen houses were sold in Stowe between Jan. 1 and March 31, compared to 11 in the same period in 2010. The median selling price dropped 7 percent, to $555,000, compared to $599,000 during the first quarter of 2010. The average price decreased 44 percent, to $475,568 from $845,809 in 2010. Six houses sold for under $500,000; eight sold for between $500,000 and $1 million. • Seven condominium units were sold in Stowe during the first quarter, up from five a year earlier. That improvement of two sales equates to a 40 percent increase. The median price increased 37 percent, from $263,934 in 2010 to $361,500 this year. Additionally, a mountain cabin at Spruce Peak sold for $2.5 million. • Open land is the slowest area of the Stowe market, with no sales in the first quarter of 2011, and just one a year earlier. Meanwhile, there was a 23 percent increase in the number of open land parcels on the market. Unlike home prices, land prices haven’t receded, resulting in fewer land sales, said Eric Phaneuf, owner-broker of Sterling Realty. Second-home buyers have driven the Stowe rebound, with Realtors reporting that buyers are looking beyond the lower price points that dominated sales in 2010. Buyers are interested in a wide range of properties, from small ski chalets to rambling farmhouses, but it’s the purchase price that’s the most important factor in closing a sale, Realtors say. While tighter lending restrictions are making things more challenging for first-time homeowners, local banks are offering some programs to help. “It’s a matter of educating people who are renting that they can buy if they get the right program,” Gaines said. Selling prices are generally about 95 percent of asking prices, Phaneuf said. Phaneuf’s clients have diverse budgets and needs. One is looking for a ski house in the $450,000 to $600,000 range. Another is looking to build and has a budget of up to $1.5 million. Still another wants to buy a primary residence for around $350,000. Most are confident enough to buy because “they sense that the market has bottomed out and that asking prices are fair,” Phaneuf said. But they’re taking time to find properties that match their criteria. In the first quarter, houses priced between $500,000 and $1 million had the largest increase in sales — 21 percent — compared to the fourth quarter of last year, Macdonald said. There were no first-quarter sales of homes priced $1 million and higher; there were two sales in the first quarter of 2010. Realtors say most buyers for million-dollar properties make purchasing decisions later in the year, after they’ve received yearly bonuses and paid their taxes. The number of houses for sale in Stowe is shrinking this year, after rising sharply last year. The number of houses for sale dropped 7 percent in the first quarter of this year, compared to year-ago numbers, and dropped 20 percent from the fourth quarter. That bodes well for future sales, because shrinking supply generally translates to higher prices and quicker sales. Outside of Stowe, the Lamoille County housing market shows 20 sales in the first quarter, compared to 18 a year earlier. Unlike the Stowe market, the median and average prices increased from the first quarter 2010. The median price rose 12 percent, from $175,750 to $196,002. The average price increased 16 percent, from $178,908 to $206,765. “The buyers are coming out now and it has become very busy in the Morrisville office,” said Penny Mason-Anderson, a Realtor with Pall Spera Company Realtors. Many are first-time buyers looking for homes in the $150,000 to $200,000 price range. Price counts, though. Morristown had 11 first-quarter sales of homes under $200,000, the same as in the first quarter of 2010. Seven homes sold at prices between $200,000 and $300,000, up from five a year earlier. Two houses sold for more than $300,000, the same as the first quarter of 2010. The number of houses for sale in Morristown rose 3 percent from a year earlier. Open land sells better in Lamoille County than it does in Stowe, mostly because it sells for less. Most parcels of open land are priced below $100,000 in the county. Five parcels of open land were sold during the first quarter 2011, up from two a year earlier. The median price for open land dropped 39 percent, from $99,000 to $60,000. The average price decreased by 33 percent, from $99,000 to $66,000. Four pieces of land sold for less than $100,000; one sold for between $100,000 and $200,00, and none sold for more than $200,000. Peggy Smith and McKee Macdonald, brokers with Coldwell Banker Carlson Real Estate on Main Street, Stowe, working as the Smith Macdonald Real Estate Group, have received Coldwell Banker sales awards for 2010. Smith earned membership in the company’s International Diamond Society, a level achieved by only the top 15 percent of all representatives worldwide in the Coldwell Banker system. Macdonald has been named to the company’s International President’s Elite. Only the top 3 percent of all representatives worldwide in the Coldwell Banker system qualified for this group. Smith was named to the Coldwell Banker International Sterling Society and Diamond Society in 2008 and 2009. Macdonald is a member of Corcoran’s Multimillion Dollar Club for 2010. Both are Coldwell Banker Previews International specialists. McKee Macdonald of Coldwell Banker Carlson Real Estate of Stowe has earned the Coldwell Banker Previews International Property Specialist designation. Only 8 percent of more than 97,000 Coldwell Banker sales associates have earned the designation. Coldwell Banker Previews International is a comprehensive marketing effort designed specifically for marketing luxury residential properties to affluent buyers worldwide. Certification requires meeting performance criteria in sales of luxury properties, and completion of a prescribed certification course, said Leslie Gauff, broker-owner of Coldwell Banker Carlson Real Estate. Macdonald, a Stowe native, recently joined Coldwell Banker Carlson Real Estate after eight years with Corcoran Real Estate in New York City. He received the Coldwell Banker International President’s Elite sales award for 2010 and he was a member of Corcoran’s Multi-Million Dollar Club for 2010. The Smith MacDonald Rest Estate Group official 2010 year end report appears to have some good news for Lamoille County. The report is a yearly survey of residential real estate sales in Stowe and the rest of Lamoille County, as well as Waterbury. In the report, data from all transactions that took place in the last calendar year is compared with those sales that were closed in each of the previous four years in order to provide an overall examination and analysis of the local residential and land real estate markets. The report went on to state that Lamoille County also saw an upward trend in real estate sales, but that Waterbury actually saw a decrease in 2010. According to the report, the rest of Lamoille County (excluding Stowe) saw a 27% increase in real estate sales as compared to 2009. Waterbury saw a 38% decrease in 2010 from 2009, but the decrease may have been due, in part, to the high increase that Waterbury experienced in 2009. Along with the sales of lower priced homes, another factor related to the overall increase in real estate sales across the county was the attractive low mortgage rates throughout the 2010 year, with the 30-year fixed rate mortgage reaching a record low in the month of November. Residential real-estate sales dropped 34 percent in 2010 compared to 2009, with 21 units sold vs. 32. Sale prices also fell. The median price — the price at which half of all sales are higher and half are lower — dropped 8 percent, from $264,500 in 2009 to $243,000 in 2010. The average price fell further, 21 percent, from $303,248 in 2009 to $238,414 in 2010. Many real-estate buyers in Waterbury are looking for mid-priced homes that don’t need a lot of work. “We worked with many first-time home buyers in 2010, looking for small, energy-efficient homes under $300,000,” Lyons said. “They generally were not interested in homes that needed a lot of work. Updated features were important. In real estate, strong sales often come down to location. Waterbury’s convenient location, coupled with the predicted economic recovery, could translate to an upturn in 2011. “With this growth, we expect more employment opportunities in the area and thus a larger demand for properties,” Macdonald said. “Also, the fact that Waterbury sits almost equal distance to Burlington, Montpelier and Stowe adds to its market appeal. Things are looking up in the local real-estate market, where right-priced homes and low mortgage rates have sparked an increase in sales. First-quarter real-estate sales in Stowe ran 24 percent ahead of year-ago numbers, and across the rest of Lamoille County, sales were up 25 percent.